Southern Cross Care Residential Care has completed the roll out of Tork hygiene products across its 17 residential care homes in South Australia and the Northern Territory. The homes have been installed with Tork hand towels, toilet paper, napkins, traymats and cleaning products. Completed over three months across homes in South Australia and Darwin, the implementation also included site audits, dispenser changeover, training and ordering support. Group manager property and procurement Charlie Way said the implementation and roll out was the most important part of the tender. “It was the comprehensive implementation plan that ultimately won the business for Tork,” he said. 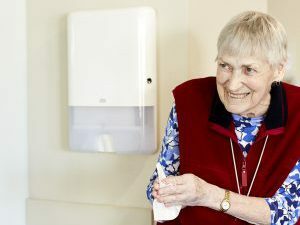 Way added that switching to Tork has helped the aged care facility create a “stylish and cohesive look across all the bathrooms and help reduce housekeeping labour”. All new Southern Cross Care facilities will also now be specified with Tork dispensers.